The 2016 James Beard Foundation (JBF) Awards ceremony next Monday (May 2) at Chicago’s Lyric Opera House is a welcome return engagement. Almost exactly one year ago, the 25th annual awards ceremony was held in Chicago, marking the first time “the Oscars” of the nation’s culinary world had ever been held outside of New York City. We at FamilyFarmed were so excited about this recognition that we published the article, “Welcome to Chicago, James Beard Foundation: 10 Delicious Facts About the Windy City.” The piece aimed to capture the multi-dimensional impact that the Good Food movement has had in our region. 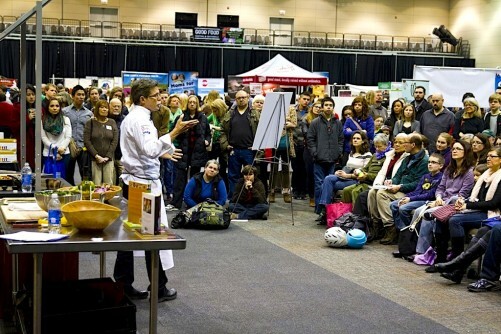 We had the pleasure of covering the awards ceremony and produced a subsequent article that focused on the many awardees who represented the culinary community’s awareness, engagement and activism in Good Food principles such as local, sustainable, humane and fair. 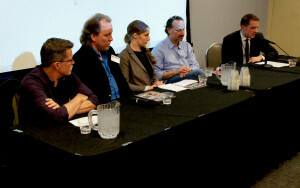 This, in turn, helped us foster a closer relationship with the James Beard Foundation: Kris Moon, the organization’s vice president, contributed an article to our website on how the Foundation is helping encourage chef activism, and moderated a panel at our Good Food Trade Show & Industry Conference in Chicago on March 25 that included leading local chef-advocates such as Rick Bayless, Paul Fehribach, Bruce Sherman and Abra Berens. So with the JBF Awards coming back to town, the best second helping we could think of is this rundown of the biggest Good Food developments in Chicagoland over the past year. • RECOGNIZING CHICAGO — THIS YEAR’S JBF NOMINEES: Here is the easiest prediction for Monday’s JBF Awards. Someone from Chicago will win the medallion for Best Chef in the Great Lakes region. That is because all of the nominees — Abraham Conlon of Fat Rice, Curtis Duffy of Grace, Erling Wu-Bower of Nico Osteria (part of the One Off Hospitality group co-founded by Chef Paul Kahan), Andrew Zimmerman of Sepia and Lee Wolen of Boka — are Chicago chefs. Sepia also is a nominee for Outstanding Wine Program. Boka is the flagship of a big and growing restaurant group that is receiving a lot of attention from JBF judges this year. Owners Kevin Boehn and Rob Katz are finalists for Restaurateur of the Year (“Boka” comes from the first letters of their last names), and Meg Galus of Boka is up for Outstanding Pastry Chef. JBF chefs will get to see what the Boka’s big deal is about, as a special lunch is being held in their honor at Swift and Sons, a steakhouse in the West Loop neighborhood that is one of the group’s latest offerings. The genius of Chef Grant Achatz also is being acknowledged, as his Alinea is up for Outstanding Restaurant, and Jenner Tomaska of his Next restaurant is a nominee for Rising Chef of the Year. 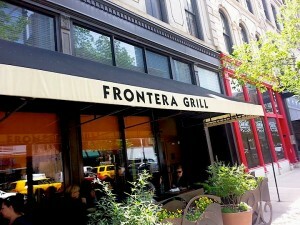 Frontera Grill, on Clark Street in Chicago’s River North section, opened in 1987 and is the flagship of chef Rick Bayless’ regional Mexico food enterprises. And no James Beard Awards ceremony in Chicago would feel right without a nomination for Chef Rick Bayless — a multiple James Beard Award winner and local Good Food pioneer — and the regional Mexican cuisine at his Frontera Group of restaurants. Topolobampo, which adjoins the original Frontera Grill in the River North community, is up for outstanding service, and has a Chicago competitor in North Pond, whose chef Bruce Sherman won the 2012 Great Lakes Chef of the Year Award. Some of these top chefs have been growing their restaurant empires. Achatz and his business partner Nick Kokonas recently opened Roister, the most casual spot in their restaurant group. Bayless and Frontera group are opening side by side spots on the West Loop’s Restaurant Row: Leña Brava, a seafood-forward restaurant with a serious mezcal program, and Cruz Blanca, a brewpub featuring a Oaxacan-style taqueria. Boka Group has also been adding to its roster of great restaurants, all in the booming Fulton Market area that long was a meatpacking and produce wholesale hub. Chef Chris Pandel opened Swift and Sons and Cold Storage in the building — a rehabbed former food cold storage warehouse — that now houses Google’s Chicago offices. Stephanie Izard (well-known for her Girl & The Goat) recently opened Duck Duck Goat, the most acclaimed Chinese restaurant east of Shanghai. And Momotaro — which won Chicago Magazine’s Best New Restaurant of 2015 — is led by chef Mark Hellyar, formerly of Washington D.C.’s Restaurant Nora, the first certified organic restaurant in America. • INDOOR GROWING…AND GROWING: Two of the biggest Good Food developments involved MightyVine’s tomatoes and Gotham Greens, produced in indoor growing facilities that have brought the Chicago area (with its short growing season) a big step closer to year-round availability of some of the most popular consumer staples. They join FarmedHere‘s indoor vertical farm, located just west of the city in Bedford Park, in making the Chicago area the epicenter of the nation’s large-scale year-round production. MightyVine tomatoes are grown in a hothouse facility in Rochelle, Illinois, about 80 miles northwest of downtown Chicago. Using techniques that were developed and have succeeded in The Netherlands, MightyVine is growing tomatoes that are much closer to the taste and texture of outdoor-grown tomatoes than the traditional hothouse varieties. A number of Chicago’s top chefs are among MightyVine’s most avid customers. The demand prompted MightyVine to announce in March that it is doubling its capacity by building a second 7.5-acre hothouse. Gotham Greens is producing several varieties of lettuce, other greens and herbs on the broad rooftop of a year-old ecologically friendly Method soap factory. The factory and farm are located in the Pullman neighborhood on Chicago’s South Side, where a long period of industrial decline is being addressed by a number of recently opened or planned food businesses. Gotham Greens’ growing technology also is imported, only this time from New York City, where the company has three sprawling rooftop farms. • SPEAKING OF SALADS: Salad… from a vending machine? That’s a concept that Chicago-based Farmer’s Fridge is popularizing in our region. 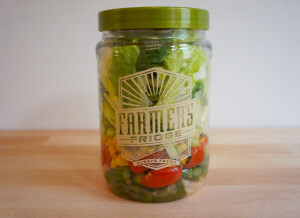 Its salads, crafted in the company’s kitchen in the West Loop neighborhood, are sold in recyclable plastic jars from custom-made vending machines, and taste remarkably fresh — not surprising, given that the machines are changed out every day, with any leftover product donated to nonprofit groups that provide food to those in need. The company, just a bit more than two years old, had grown to 35 locations by February, with goals to increase to 100 sites by September and 140 by the end of this year. Its re-conceptualizing of vending machine food has gained national attention: NBC Nightly News carried a featured story on Farmer’s Fridge, featuring company founder Luke Saunders, last November. And yes, some of the Farmer’s Fridge salad blends include MightyVine tomatoes and FarmedHere greens. • LOCAL FOODS BOOMING: We can’t seem to get far from those tomatoes, but the place to find them virtually all the time is the Local Foods retail store in the Bucktown area not far from downtown Chicago. The reason is that food entrepreneur Jim Murphy is the chairman of both Local Foods and MightyVine, as well as Handcut Foods, which does school foodservice and corporate catering with mostly local and sustainable foods. 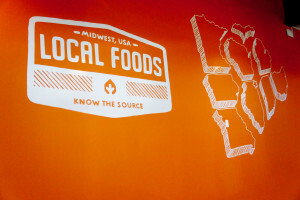 The Local Foods store is one of the big new developments since the last James Beard Awards. The retail outlet grew out off the company’s food hub distribution business which aggregates products from small Midwestern farms and artisan producers and sells to 200 customers, most of them restaurants. The retail store features seasonal local produce — which makes it something of a year-round indoor farmers market — along with locally and sustainably produced meats from butcher Rob Levitt and his team at The Butcher & Larder (which moved into the space last June from its original store nearby) and Stock Café, a casual eatery whose chef Abra Berens gets nearly all of her ingredients from the store’s shelves. • GOOD GRAIN GAINS GROUND: While gluten-free products have become a major sector in the food industry in recent years, there are those who have argued strongly that the problem is not gluten, but rather poor quality grain that has been stripped of most of its nutritional value. In the Chicago region, this cause unites producers such as Hazzard Free Farm and Spence Farm with bakers such as Publican Quality Bread and Baker Miller, both in Chicago, and Hewn in suburban Evanston. One sign that this Good Grain movement would continue to grow arose shortly after last year’s JBF awards. Harold Wilken, who owns Janie’s Farm in central Illinois, invited local farmers to his property to learn about his organic grain growing techniques, and dozens came to his expansive shed to hear how they could convert from conventional to sustainable production. 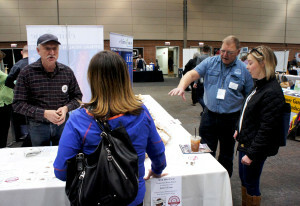 Wilken is now expanding his operation by developing a grain hub and milling operation that would turn locally and sustainably produced grain into flour for the Chicago market. This program is in partnership with Wild Hive Farm in upstate New York, one of the first grain hubs in the United States. FamilyFarmed is a strategic partner on this project. • CRAFT BEER BOOM CONTINUES: One sector that will be happy with a greater availability of locally produced, high quality grain is the region’s booming craft beverage industry. While craft beer and spirits makers have been drawing customers because they are locally made, an increasing number of producers are also seeking more locally grown ingredients to go into their beverages. It is going to take a lot of local ingredients to satisfy this growing interest among craft producers, because there suddenly are so many of them. According to the Brewers Association, the national trade organization for craft beer, the number of craft breweries in the state of Illinois nearly tripled over the course of just four years, from 54 in 2011 to 157 in 2015. 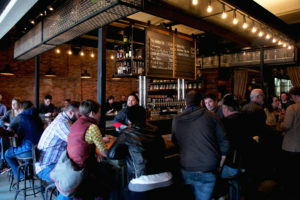 The vast majority of those are in Chicago and its environs: Crain’s Chicago Business reported that as of last October Chicago had 146 breweries, second only to the 196 in Portland, Oregon, one of the original hubs of the nation’s craft beer craze. A handful of the local beer makers have production facilities qualify as factories. The 300,000 square foot brewery opened in 2014 by California-based Lagunitas — the nation’s 6th largest craft brewer — is by far Illinois’ biggest, though local craft beer pioneers such as Revolution and Half Acre have undergone rapid expansion. But most craft brewers are still quite small. One that is doing some very interesting things at the culinary/artisan Good Food level is Forbidden Root, which is utilizing roots and other botanicals in its recipes. Forbidden Root earlier this year opened a gastro-brewpub, retrofitted into what long ago was a movie theater, that is receiving positive reviews for its food as well as its beers. • FOOD TO MARKET CHALLENGE: The Good Food sector has grown exponentially in the Chicago region over the past decade and more, but there are still obstacles to even bigger growth. Many of these involve supply chain issues: It remains difficult for many small to mid-sized producers to connect with buyers and to master the logistics of getting their products to market. That issue has prompted The Food to Market Challenge, a project of the Food:Land:Opportunity, a philanthropic effort to support local sustainable food funded by the Searle Funds at The Chicago Community Trust. The competition will award $500,000 to the team — which must include at least one farmer from the Chicago foodshed — that is deemed to have developed the best solution to supply chain issues affecting the metropolitan Chicago food market. Even Chicago’s McCormick Place, the largest convention center in America, is applying to the challenge in a bid to double the size of its current half-acre organic rooftop farm that it operates in partnership with the Chicago Botanic Garden and its Windy City Harvest program. The registration deadline for participating teams expired on April 26, and proposal entries must be submitted by May 10. Five finalists will be selected by June and they will be invited to pitch to the selection committee at an Oct. 26 event at which a winner will be chosen and announced. • LET’S DINE OUT… AT THE AIRPORT? Throughout most of the history of airline travel, delicious dining options have been few and far between, and until very recently, tasty and healthy and sustainable food choices were virtually non-existent. That began to change in recent years when Rick Bayless — already well known as a local Good Food pioneer — opened his fast-casual Tortas Frontera at O’Hare International Airport. The concept is now spreading, and one of those is the soon-to-open Publican Tavern, the latest offering of Chef Paul Kahan, another Chicago Good Food leader, and his partners in the One Off Hospitality Group. 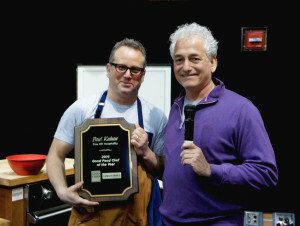 FamilyFarmed was pleased to present Kahan with its 2016 Good Food Chef of the Year award at its Good Food Festival on March 26, for his dedication to local and sustainable sourcing and for his work with Pilot Light — the nonprofit he co-founded with chef peers such as Matthias Merges and Jason Hammel — which works with Chicago Public Schools to integrate food education into the children’s curriculum. • PROGRESS AND INNOVATION IN THE GOOD FOOD MARKET SECTOR: This is looking a bit ahead, but Whole Foods Market — the nation’s biggest supermarket chain focused on organic and natural foods — announced at FamilyFarmed’s Good Food Conference that it has set September 28 as the official opening date for its new store in the largely African American Englewood neighborhood on Chicago’s South Side. This much-anticipated store location is aimed at revitalizing a community that once was one of the city’s commercial centers, but has endured severe economic decline and attendant social problems in recent decades. This is a major development for a retail chain that has been oriented to a higher-income clientele. More broadly, Whole Foods is ramping up its efforts to bring jobs and economic development to the South Side, which has long been underserved by the food industry. The company will be building out a 140,000 square foot warehouse in the Pullman community, and the Englewood opening will be preceded by a store in the Hyde Park neighborhood that is scheduled to debut on June 22. Whole Foods also has announced that Evergreen Park, a suburb immediately adjacent to Chicago’s Southwest Side, will host the area’s first store in its new economy-minded “365” chain, which is slated to open in 2018. Whole Foods Market also introduced a new program with Fortune Fish and Gourmet to give local food artisans low-cost distribution services to all the Whole Foods stores in the Midwest. In addition, Kroger, the nation’s largest supermarket chain, bought Mariano’s, the Chicago-based chain that sells a combination of natural, organic, and conventional food. Fresh Thyme Farmers Market also continued its rapid growth in the region with a major infusion of financing from Meijer, the Michigan-based chain of megastores. Enjoy Life Foods, which built a big consumer market for foods that are “free from” common allergens, was purchased by Mondelez International, a major consumer packaged goods manufacturer. Enjoy Life CEO Scott Mandell is now finishing development of a new 200,000 square foot production facility. SPINS, the leading data company in the natural and organic food industry, moved its headquarters from suburban Schaumburg to Chicago. KeHe, a $5 billion natural and organic food distributor based in suburban Naperville, recently announced that it achieved B Corp Certification, making it the largest company in the world to certify its environmental and social progress. And Presence Marketing of suburban Barrington continued its national leadership as the largest independently owned natural foods broker. • REDUCING FOOD WASTE: By varying estimates, somewhere between a third and two-fifths of all food produced in the United States goes to waste, at a time when there is still significant food want. This is an issue that is getting major national attention through efforts such at the Natural Resources Defense Council’s Save the Food campaign. And it is certainly getting significant attention in our area as well. Zero Percent is one organization that is leading the way in this effort, addressing both food waste and food want by connecting restaurants and other businesses that have excess food with nonprofit groups that provide food assistance to those in need. Raj Karmani, founder and chief impact officer of Zero Percent, was a panelist in the opening symposium at FamilyFarmed’s Good Food Financing & Innovation Conference in Chicago on March 24. 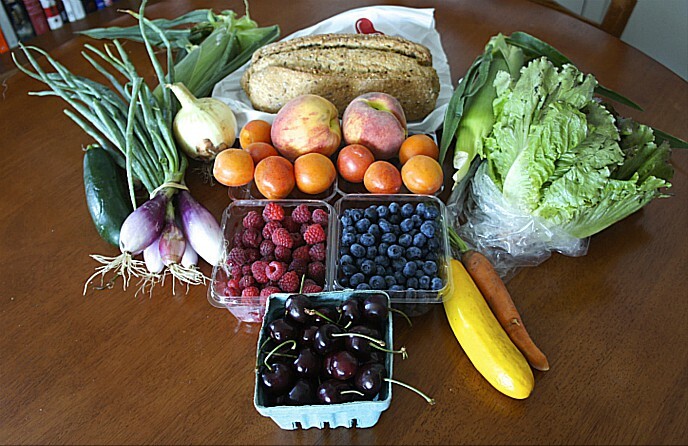 • FAMILYFARMED FLOURISHING: We can’t be expected to write an article about the good news about Good Food without mentioning the big positive developments within our own advocacy organization. FamilyFarmed’s second cohort of nine promising entrepreneurs just graduated on April 25 from our Good Food Business Accelerator. The $23 million in debt and equity financing generated in recent years between participants in our Accelerator program and our Good Food Financing & Innovation Conference underscores both the impact of our organization’s efforts and the rising interest in Good Food businesses within the investment community. 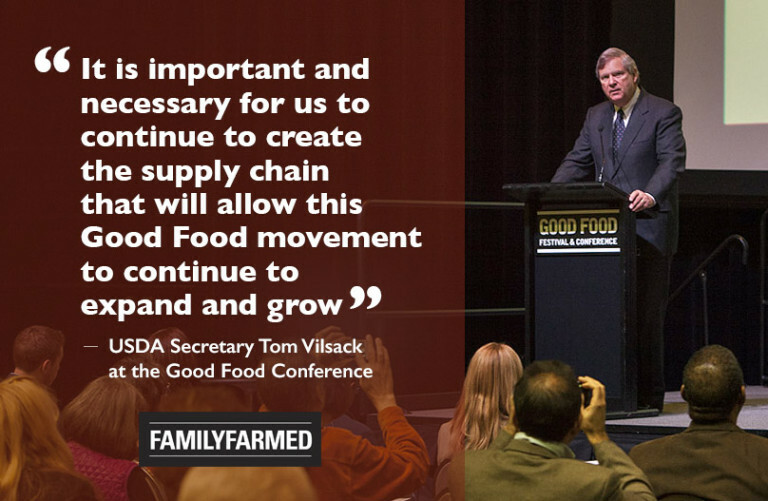 The growing consumer demand for better food is getting ever-increasing attention from leading policymakers, including U.S. Agriculture Secretary Tom Vilsack, who in March became the first Cabinet member to speak at our Good Food Festival & Conference (and delighted us by using the phrase “Good Food movement” three times in his speech). FamilyFarmed’s Wholesale Success program has now trained more than 9,000 farmers in 40 states in best practices in production, handling, food safety and marketing, and we are now working on a follow-up program titled Direct Market Success, focusing on young farmer training. And we’re now closer to thick of the action after moving our offices from the suburbs to the River North neighborhood of Chicago, next to the Merchandise Mart, home to the 1871 business incubator that hosts our Good Food Business Accelerator. With all of this movement in the right direction, we hope you can see why Chicago’s status as a center for the Good Food movement makes it our kind of town. 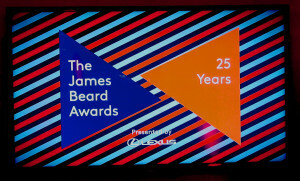 Yours too, James Beard Awards visitors. Tom Vilsack quote meme produced by Jamie McCarthy of FamilyFarmed. This entry was posted in Awards, Chef activism, Chef advocacy, Farm to table dining, Financing, Food activism, Food Artisans, Food education, Food Entrepreneurs, Food policy, Food to Market Challenge, Good Food Business Accelerator, Good Food business development, Good Food Dining, Good Food Festivals, Good Food marketing, Good Food movement, Good Food Policymaking, Good Food restaurant trends, Restaurants and Good Food, Sustainable dining, Sustainable food business investment, Sustainable food retailing and tagged Chicago Good Food, FamilyFarmed, food waste, Good Food and restaurants, Good Food Business Accelerator, Good Food Festival & Conference, Good Food movement, James Beard Awards, James Beard Awards Chicago 2016, James Beard Foundation, James Beard Foundation Awards, Paul Kahan, Rick Bayless, U.S. Department of Agriculture. Bookmark the permalink. ← Even Jerky Is Elevated By The Good Food Movement. Yes, Jerky.